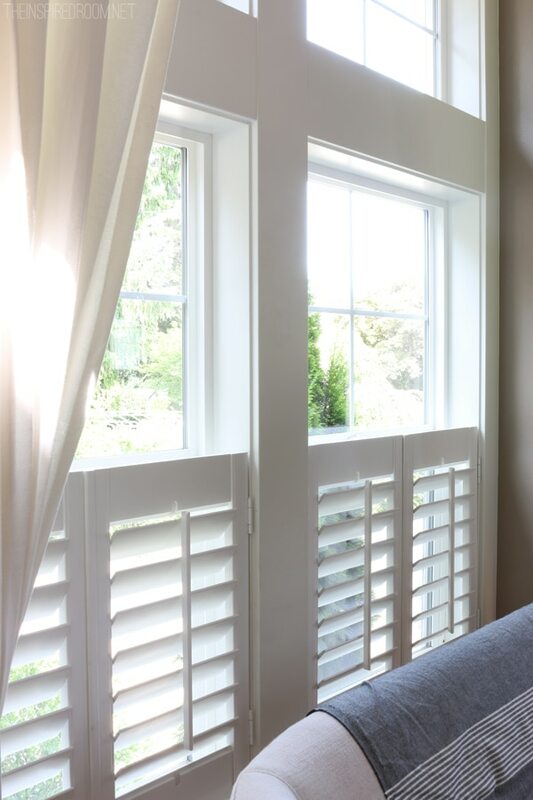 I‘ve always been in love with classic plantation shutters. I had them installed in my last two houses in Portland and they were always one of my favorite features. They make me feel like I’m living on a coastal plantation, with the ocean breezes flowing through the palm trees and into the windows. 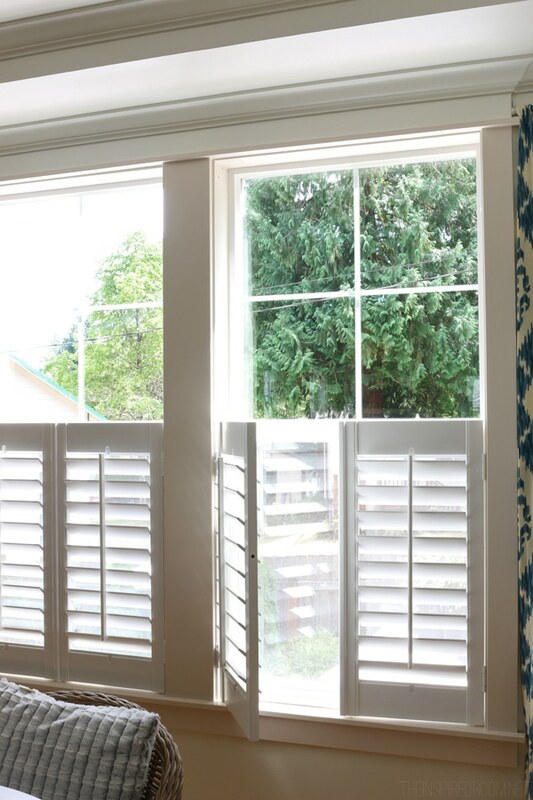 Shutters add amazing chunky architectural detail, they offer privacy control and yet still allow light to stream through. Plus, they are so easy to keep clean and they are beautiful, too! There were several rooms in this house that I thought would benefit from shutters and they have been on my wish list for years, but one thing or another was always higher on the list of “projects to do.” Well, my dreams finally came true a couple of months ago when we decided it was time to take the plunge and at least finish our front two rooms (the gathering room and dining room) with shutters! Our dogs always go crazy looking out our front window at people and dogs passing by so we thought sometimes shutting shutters (its like a tongue twister!) might just make our house quieter, too. We wanted the shutters for the dining room to provide more privacy. Our shutters are from Bali Blinds. They graciously offered to partner with me on a project years ago but I was so slow to get my act together that it stayed on the back burner. But finally I was ready! I was tired of the open windows and just wanted to finish the rooms, so I took a little shopping trip to JC Penney to look at my options. 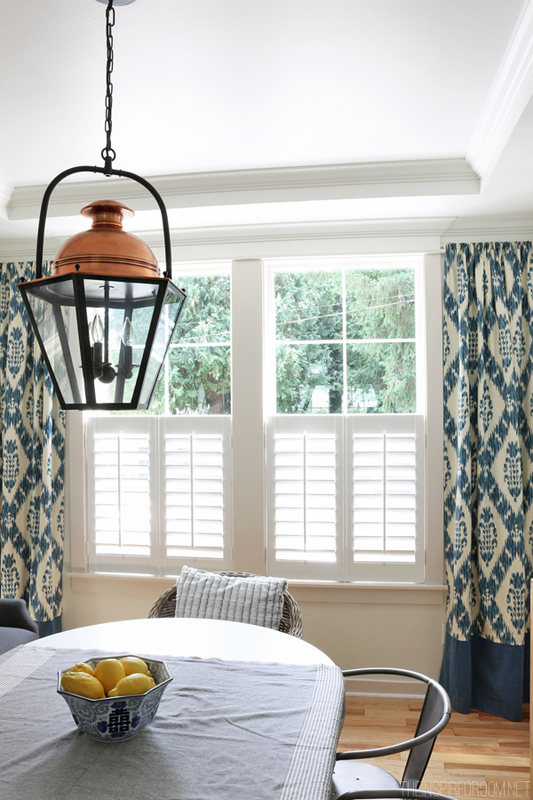 The sales person was really helpful in answering all my questions–I was mostly worried about measuring so I was relieved that Bali Blinds sends out an installer to measure and install because you really want your shutters to fit perfectly. Because our house is a new craftsman style house and our ceilings are really high, I knew I wanted wide slats so they would make a real statement in the room. I brought some samples home so I could see the colors up against our white wood work to make sure they were a pretty close match. 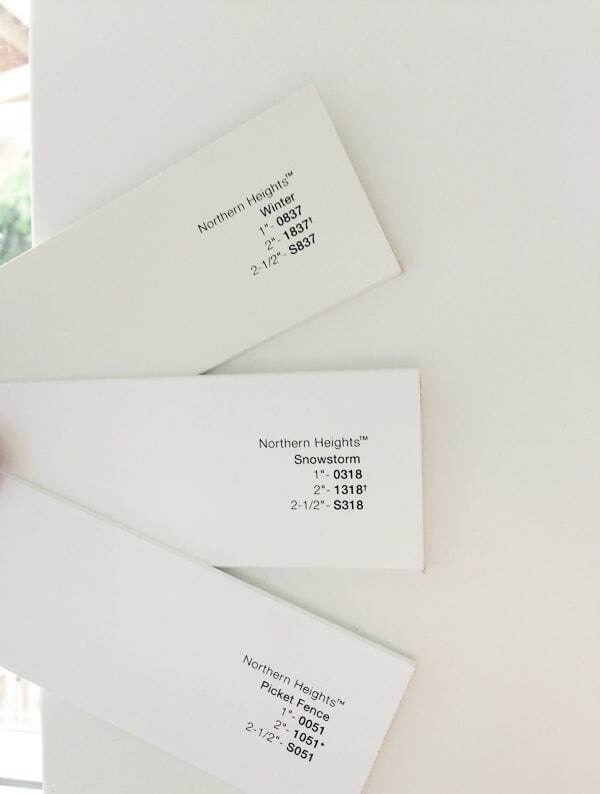 We decided on 3 1/2 in wide slats in “snowstorm” white. There was an option of the little tilt bar being hidden in the back, which is kind of cool because they look extra clean and crisp. But I decided I really liked the center bar simply because I felt like it looked a little more traditional, which felt right for our home. You don’t really use the tilt bar for controlling the blinds so it really doesn’t matter where the bar is, it’s just personal preference. My mom recently installed shutters and went with the hidden tilt bar and hers look great, too, so it just depends on what look you want! You can see that since my windows are “double” my shutters are basically two sets, one set for each window in each room. Each set is split in the middle so you can open them to clean the windows or even just let in extra light if you wanted to. I mostly just keep them shut with the louvers slightly open for privacy and light during the day. I decided to have the shutters installed only part way up because our view above is so pretty with the trees and there was really no need for privacy higher up on the windows. I really wanted to keep as much light coming in as possible so we had them made to go up just to the lower window. I am SO happy with how they turned out! Seriously, every time I see them in the house through the window when I come through my front door I say “HEY LOOK AT THOSE PRETTY SHUTTERS!” In fact, I say that even when I’m just walking through the house, too. Ha. You know how I feel about these kinds of architectural details. They matter to me! 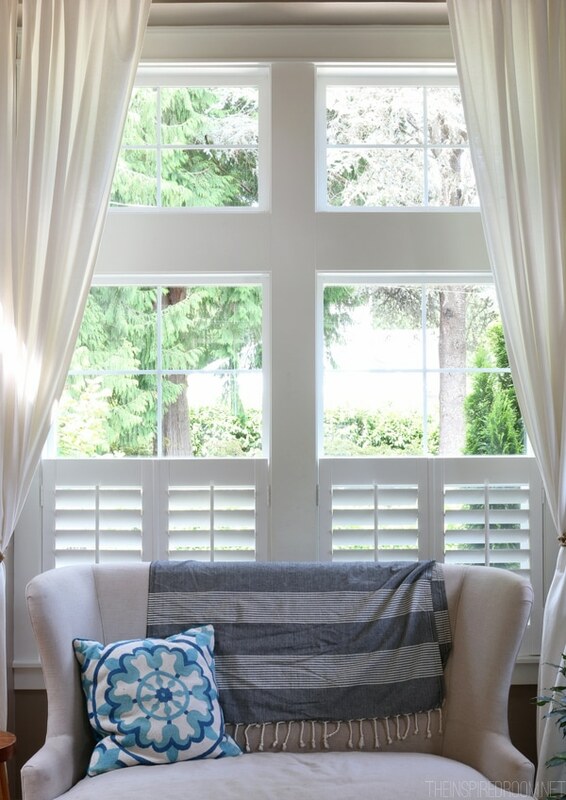 Shutters really add something no other kind of window treatment does. I love raising and lowering the louvers for privacy and light. Opening them up wide every morning is one of my favorite morning rituals. 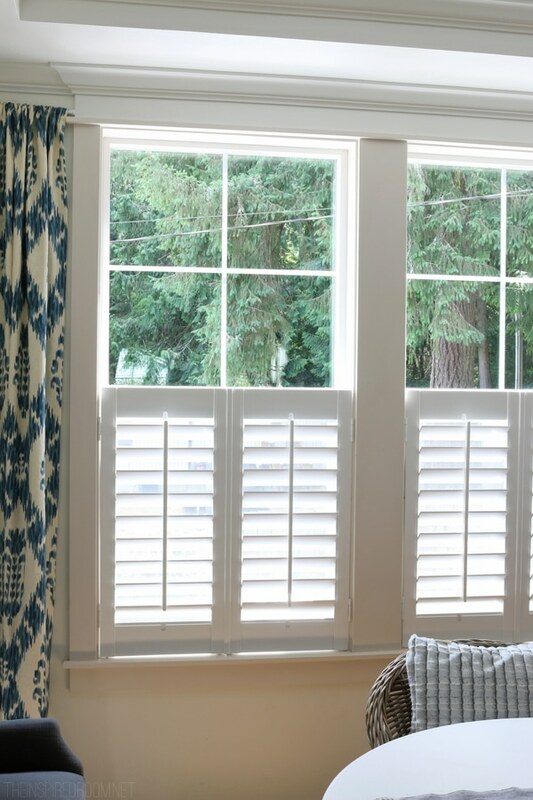 My dream was to continue to install shutters around the house in my office, our TV room and other rooms but since we have decided that we are likely moving I’m thinking I’ll be installing shutters in the yet-to-be-determined new house instead. It’s going to be hard to leave these beauties behind, I didn’t get nearly enough time with them. Sigh. It’s really going to be hard to leave my whole house behind after how much love we’ve poured into it, but the shutters just might be the deal breaker for me where I just can’t bring myself to go. At least now I know that they really do keep my dogs quieter, so I won’t wait so long to install them in the next house. 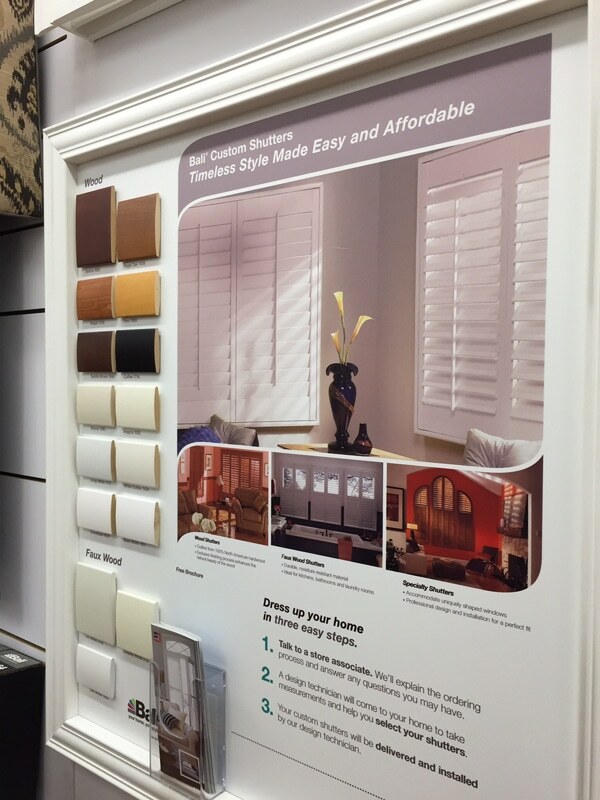 Thank you to Bali Blinds for partnering with me on this project! *My dining room copper lantern can be found here! Hello, friends! Recently I wrote a post about our new leather sofa and how it fits in with the copper and wood in our home. So today I thought I would show you a couple pieces of my copper collection! While you might think copper is kind of an expensive thing to collect, it really hasn’t been! My copper pots, colander, tea kettle, pans and bowl were bargains, they came from estate sales and yard sales! 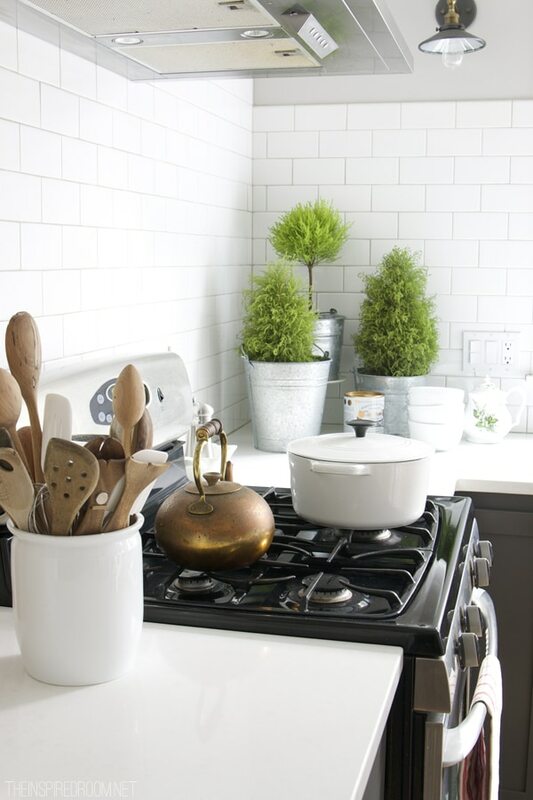 I’ve always hung pieces of my copper collection in my kitchens as a decorative element on the wall or on a pot rack. I really love the patina of copper, don’t you? 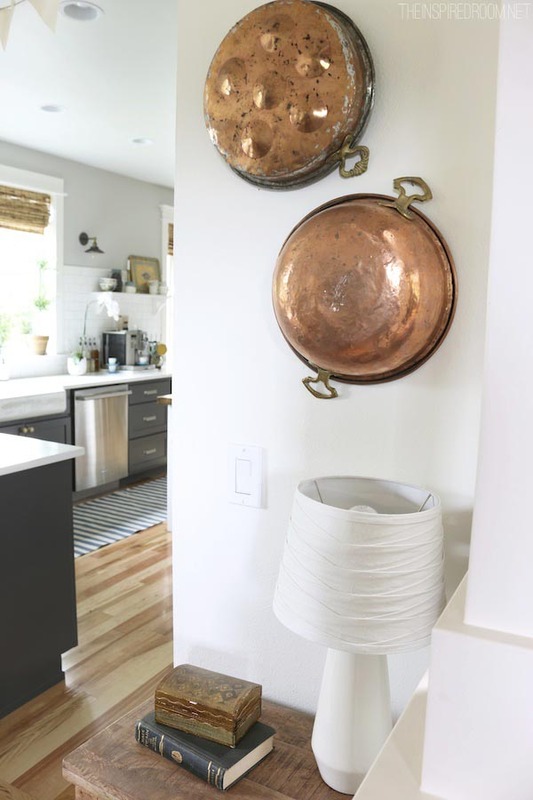 Awhile back I realized my copper pots were still out in the garage (where everything I didn’t know what to do with went when we moved here, um, six years ago, gah!). So, I brought them in and found a great spot for a couple of them on the wall in the dining room. Not only does the copper look great with our copper-topped dining room light, I think it looks really pretty with the wood floors, too. Copper is such a lovely warm metal. It adds a nice richness to a room and a little shine to contrast with the wood. My copper and brass teakettle has been with me a long time too. My favorite accessories are always the things I’ve collected over time. It takes awhile to build up a collection but that’s part of the fun! 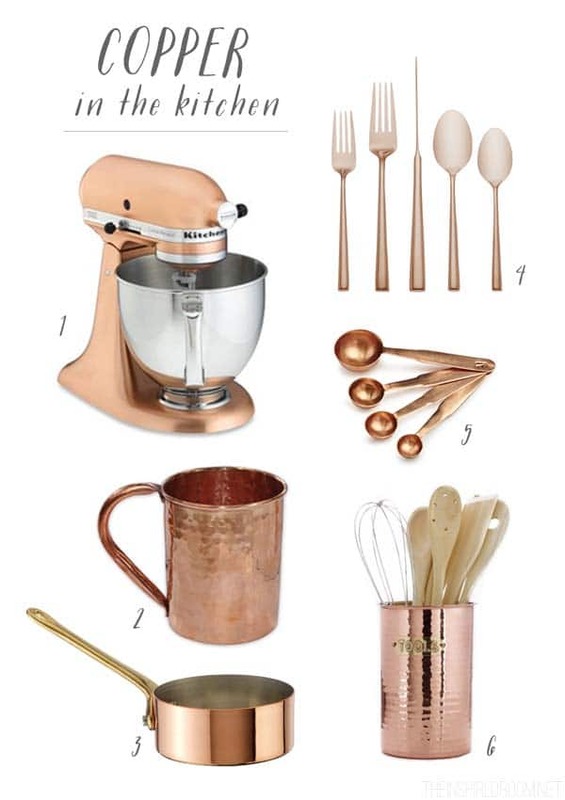 Do you have any copper in your home?